Minmetals Mining Holdings concluded Strategic Cooperation Framework Agreement on Research Institute for Intelligent Mines with CISDI, Hefei University of Technology on August 16th, 2017. 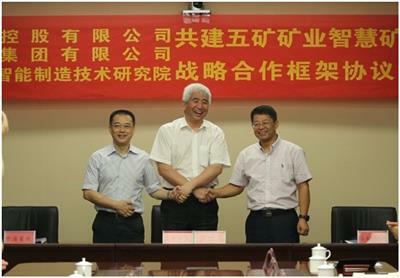 Mr Wei Shuxiang, Chairman of Minmetals Mining Holdings, Mr Yu Zhaohui, Managing Director of CISDI Group, Mr Liu Zhifeng, Vice President of Hefei University of Technology signed on the Agreement respectively. Mr He Fayu, deputy director of Science & Technology Division of China Minmentals attended the signing ceremony. According to the Agreement, the three parties will jointly explore and establish a science and technology innovation system for common development of Industry, Academe and Research Institutions driven by the demand of enterprises. Researching activities will be carried out by relying on the mines of Minmetals Mining Holdings to overcome the critical technology difficulties in building of the intelligent mines. The research achievements will be promoted and implanted at the mines of Minmetals Mining Holdings to ensure safe, efficient and green building and operation. A team of engineering, design, building, operation and maintenance will be fostered to provide sustainable technical support for the intelligent mines. Mr Yu Zhaohui stated that CISDI would arrange for a team which integrates intelligence technology to IT to provide specialized technical support to implementation of Total Solution and whole-process services at the intelligent mines, making possible building and operation of the intelligent mines in a safe, efficient and economic way.